Water is a priceless commodity. Global warming and changes in the world’s temperature have led to drought in many places and the urgent need for water conservation. But the story of water shortage is fraught with irony; shortage in one part of the world is mocked by excess in another. In a shared global environment and destiny, it is imperative for individuals to take steps to conserve water in their daily living. 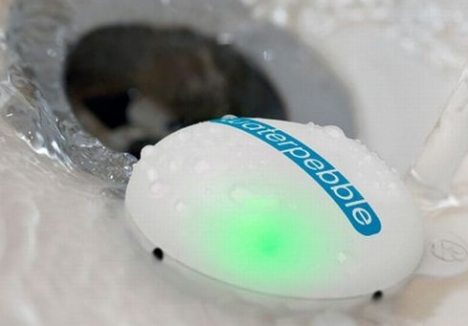 WaterPebble is a simple technological device which contributes towards a better world. The device is designed to measure the quantity of water going down the plug hole when one is using the shower. It consists of a LED-fitted pebble which will turn red, yellow, or green to indicate the amount of water used in a shower. This will alert users to any waste and prompt users to take the relevant action. The device is useful for private use at home and also commercially in hotels or public shower rooms.